I have been a huge admirer of Rhonda Byrne and her books The Secret and The Magic as they re-emphasize on my belief that each one of us is born unique with special talents. It is just a matter of time that we recognize it and un-leash our true power. This book also belongs to the same category where the authors have talked about having a hidden super star within us and have also discussed how to bring it out. Dr. Myra S White is a clinical instructor in Psychiatry at Harvard Medical Schooland an award winning instructor in Harvard’s Master of Liberal Arts Management Program. In 2010 she was selected Woman of the Year by Harvard Women’s Empowerment Network. Sanjay Jha is executive director of Dale Carnegie Training, India. He has formerly worked in senior management positions with ANZ, Grindlays Bank, Bank of America, Alliance Capital plc, and ITC Threadneedle. He has authored a cricket book and is a frequent columnist. As a child when I had read Wizards of Oz never had I imagined the way these authors have bringing out the hidden surprises of this story showing us how each one of us actually has a super power. A power to conquer the world, a strength to make our dreams come true and the capacity to make it all happen – it is just most of the times we doubt ourselves so much that we fail to see our own talent. Doubt covers our vision not letting us see the way ahead clearly and hence we never achieve all that we could have if not for our self doubt. This book is very beautifully divided into 9 chapters which are actually the nine steps one needs to take to eventually become a superstar. The book begins with the Power of Oz where the author reminds us of the story of Wizard of Oz and how in the end Dorothy concludes that all the power till now was very much within her which she failed to recognize. It is very innovative to see that before every step the authors remind us of a similar scene in the book Wizard of Oz taking us back in the story and then ahead explaining us how to connect the missing dots and make a complete picture. 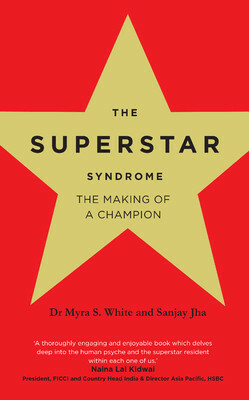 The biggest thing which makes this book more unique is it talks about some 60 superstars both Indian and Western who have become superstars in their own unique way. Two different countries, varied set of circumstances, different backgrounds and yet the result is the same - a superstar who has made a difference to the world we are surrounded with. That is exactly what the authors had in mind while writing this. They wanted to highlight that success does not depend on where you are from and who are. It matters on what you are made up of! Each and every example shared here is so inspiring that by the time you reach the end of the book it truly brings out the superstar in you! The language, narration, presentation along with easy to understand words makes this one an easy and enjoyable read.